Now that classes are over, it's officially the beginning of my summer break! Sure it's been summer for dang near two months now, but I'm finally free, and ready to take my summer by storm! I've got some pretty relaxed goals for the rest of the season, and I thought I would share them with this list. 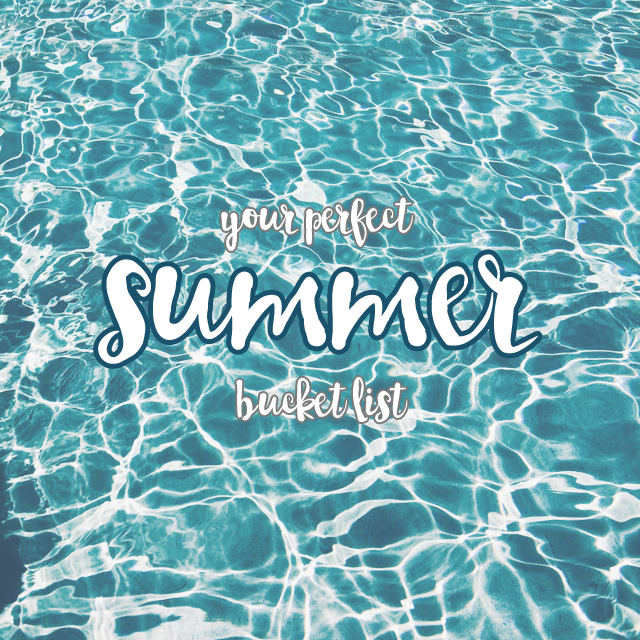 Not only is this my list of goals for the summer, it's some ideas for anyone to have the best summer ever, even if you're staying local. It's about the little things! 1. First things first, acquire sunscreen. Apply it. 2. Find a place to float for a while. River, pool, ocean, anything will do. 3. Enjoy an ice cream cone or popsicle. 4. Wear a cool hat. 5. Make a summer playlist. 6. Get in the car and drive somewhere to spend the day. Boom, you're officially on a road trip. 7. Get a funny tan line, or simply just up your Vitamin D intake. 8. Drink out of a pineapple. 9. Go somewhere you've never been. Explore. 10. Light up some fireworks. Sparklers count. 11. Sit on a porch and talk with friends or family. 13. Drink some iced tea out of a big glass. 14. Get your feet dirty. Get out in nature, barefoot. 15. Run through the sprinkler or have a water balloon fight. 16. Take a walk that doesn't involve Pokemon Go. 17. Make a craft like you're at camp. 18. Watch a summer movie. Wet Hot American Summer anyone? I Know What You Did Last Summer? Finding Dory works too. 20. Pick up that book you've been meaning to read. I had a summer class that ended last week as well so I feel you on this! Some things I'd like to do before the weather turns cooler are definitely hit the beach a couple more times, go kayaking, visit a winery, and host a cookout.